"Get in lane, and Don’t Stop," read the signpost just metres across the border. "What sort of place is this?" I pondered, as I put the foot down just a touch, to comply with the laws of the land. An airport runway, as it happened. I found myself driving across the landing strip at Gibraltar International Airport; a quick peek out both windows, thankfully, confirmed that aeroplanes were neither taking off nor landing as I proceeded. Driving across the long and winding road from Malaga, The Rock presented itself shortly after crossing another frontier, within Andalucia, as you pass into the Cadiz region of southern Spain. Getting closer, once the not-so-intuitive Spanish motorway exits are negotiated, the sheer white cliffs do mind of a chunk of Blighty, chopped off the Kent coast and dropped into the Mediterranean Sea at the base of the Iberian peninsula and just a few miles north of the Morocco coast. Having heard horror stories of yesteryear about hours and hours queuing to cross the border and onto the Gibraltar promontory, it took just a few minutes to show my passport – twice – as I edged from Spain into the colonial outpost. A Monty Python sketch is waiting to break out at the entrance to this long-disputed few acres, as first you must stop at a Spanish hut to identify yourself, before rolling all of ten yards to the British equivalent – the 38th Parallel it is not. Perhaps naively, expecting a Monte Carlo-esque setting once beyond the border control – and of course the airport runway – it was more motley than Monte as renegade scooter drivers swerved every which way, as I rounded a roundabout on the periphery of the town centre. The Caleta Hotel sits in the shadows, as the late afternoon sun dips below the top of the Rock. Outside a Union Jack flutters in the wind, inside all three hotel reception staff chat amongst themselves in foreign tongues – Spanish. Over 10,000 Spanish natives work amongst the 30,000-odd residents of Gibraltar and years of cordiality has allowed both sides to co-exist and a working relationship has been built, which has proved mutually beneficial. A Spanish barricade once stood at the crossing – erected in 1969 by Spain’s fascist leader, General Franco – and while things are much better these days, the Brexit-inspired winds of change are blowing once again. But what about the football? The Gibraltar national team are a relatively new entity, only gaining UEFA status in recent years, which saw the team partake in the qualifiers for the EURO 2016 tournament. And Gibraltar have produced a couple of half-decent results as they gained their international wings. Draws with Estonia and Slovakia were surpassed by a victory over Malta and while hardly notable, they had certainly moved on from their Island Games days, where they often struggled to get the better of the Shetlands or the mighty Isle of Wight . 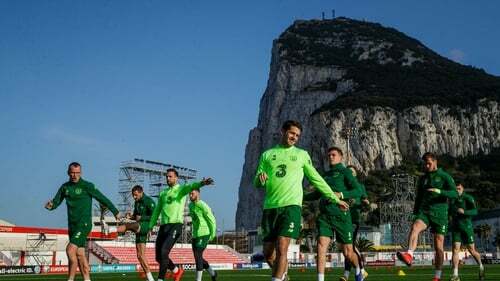 Gibraltar’s first real footballing scrutiny came in the qualifying campaign for Euro 2016, and in truth, they failed miserably as they shipped 54 goals in ten games, earning no points as Ireland, Germany and Poland, twice, beat them by seven goals. But to their credit, they have become a much more organised unit in the intervening years and since FIFA officially "welcomed" them into the footballing family, albeit reluctantly and only after a visit to the Court of Arbitration for Sport, they have come on leaps and bound. Under the guidance of new head coach, Uruguay native Julio Cesar Ribas, the team is enjoying a wave of confidence, having impressed in the recent UEFA Nations League campaign. Without doubt, Gibraltar’s biggest achievement so far has been the victory away at the Hanrapetakan Stadium last October, where they beat an Armenian side containing Arsenal’s Henrikh Mkhitaryan 1-0, Roy Chipolina scoring the only goal of the game. They also beat Liechtenstein and enjoyed a much more creditable goal difference at the end of the six games with five scored and 15 conceded. In the same campaign, they were beaten by Lichtenstein away from home, while Armenia also stuck six past them to right the wrongs of the home defeat the previous month. And while some players are starting to make an impact, including the young attacker, Tjay De Barr, who will play at Spanish side Real Oviedo next year, the team is still made up primarily of part-time players including administration staff, bricklayers, a gaggle of students and the experienced Lee Casciaro, who is a local policeman. "The two games against Ireland are in the past and it is now time to write our own history and continue what was started in the Nations League," said coach Ribas at the pre-match press conference. "We have to keep growing as a team by always working hard and we have a great mixture of young players who are under 23, and quite a few old players. And the team bring a growing confidence into this campaign as the recent results have really brought the feel-good factor to the "country", especially in these uncertain days, as motherland Britain looks set to leave the European Union. A whopping 96% of the Gibraltar population voted to stay in the European Union, with less than 100 people voting to leave. While the British government continues to try to get a deal through parliament, and get some sort of working agreement in relation to the Irish backstop, there is a sense that the Gibraltar question is going to cause as much, if not more, disturbances in the not-so-distant future. Once Britain leaves the Union, Spain may push for more of an influence in the territory and will certainly want to have a say in relation to future deals between Gibraltar and the EU. As mentioned, a huge percentage of the workforce come across the border every day, and future restrictions would certainly cause chaos about the place. A change of political status in Gibraltar could have a catastrophic affect on the football team and should Spain assume control of the promontory at any stage, the very existence of the team may come into question. A long shot perhaps, however, coach Ribas was not willing to speculate on the future of the country or the Brexit effect at the pre-match press conference. Instead Ribas focused on the positives that his team are having in Gibraltar and adding to the evident and increasing national pride. "The performances in the Nations League made the country proud, but the important thing is that the team keep developing and that the players give absolute everything for the country and the flag," he said. The Uruguay native then turned around to star attacker Tjay De Barr to ask him what the players had on their mind every time they play for the national team. "Every single Gibraltarian," responded De Barr, solemnly. Someone who was quite happy to talk about the Brexit conversation was the highest politician in the land, Fabian Picardo who is Chief Minister of Gibraltar. "Brexit is problematic for Gibraltar, it is concerning and we don’t know what options the United Kingdom parliament are going to choose. "We have been able to ensure that we have carved out protections for Gibraltar in the withdrawal agreement, and slowly we are starting to understand the logistical plans that we have to deploy. "But if you ask any Gibraltarian, we think the best possible deal would be to remain in the European Union." A nation united, it would appear, yet divisions and animosity remain between Gibraltar and Spain; the main road into the town, running from the border and dissecting the airport runway is aptly named Winston Churchill Avenue. But walking around the town centre in the most pleasant March sunshine, Gibraltar feels about as British as ballad night at Crossmaglen GAA club on St Patrick’s Day. Despite the climate and a certain amount of the houses and buildings, there does not appear to be a Spanish feel either. Not that that is unusual in this part of the world, such is the proximity of the Irish and English infiltrated Costa Del Sol. Far from an enclave full of old English expats, Gibraltar has a vibrant young, cosmopolitan demographic, with a real Italian, Portuguese and Moroccan influence, while the ever-increasing workforce are also drawn from all over Europe such is the status of the region as somewhat of a tax haven. Whatever the future holds, the footballing exploits of the Gibraltar national team have certainly helped the local population to gain a real sense of identity, emerging from the post-colonial issues that have dominated its recent history. Gibraltar are in a tough group for this Euro 2020 qualifying campaign, which starts with a home fixture against Ireland, while future opponents will include Denmark, Switzerland and Georgia. Another high-profile result or two, however, would certainly benefit this future-looking region, and the first chance will be at the Victoria Stadium tonight, as Mick McCarthy’s men come to town. Mixing football with a bit of politics, Chief Minister Picardo, emphasises the importance of how the national side is leading by example, while offering a football-themed version of the Irish backstop. "The Gibraltar Football Association is almost the embodiment of the Gibraltarian spirit. "And them finally getting recognised by UEFA and FIFA has given a boost to Gibraltar of the sort that only football can. "And I tell you one thing for sure. Kyle Goldwin, he is the Irish backstop in goal."